Cornelia Hancock is the subject of one of the progams presented at Gettysburg National Military Park. Karen Cox portrays this Civil War Nurse who was a Quaker without any medical experience who quickly earned the respect of her patients. Cornelia Hancock not only served the Army of the Potomac, she also worked with freed slaves after the war. This view was taken from the east facing west at approximately 1:30 PM on Thursday, July 24, 2008. 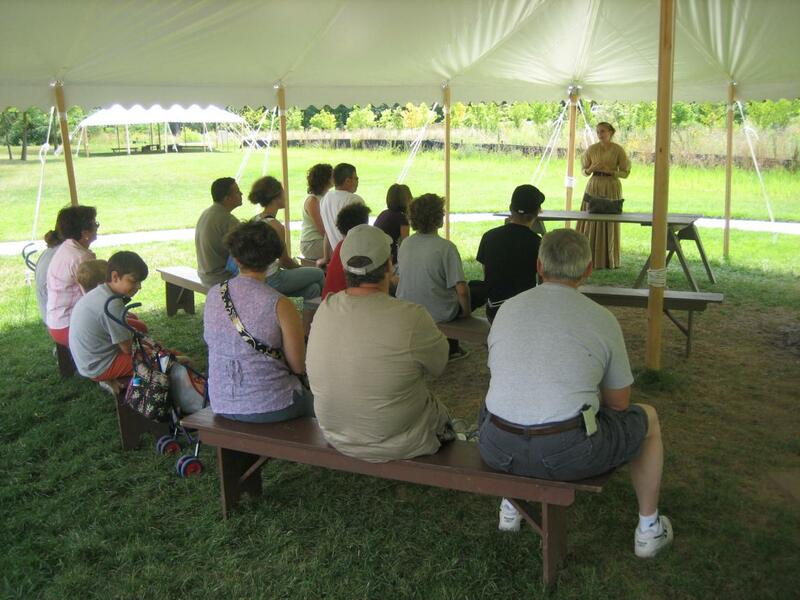 Cornelia Hancock is a program which frequently is presented outside the Gettysburg National Military Park Visitor Center. Karen does an outstanding first person impersonation of this New Jersey Quaker who came to Gettysburg as a nurse following the battle. She faithfully follows the events in Cornelia Hanock’s letters written to her family and friends while she was at Gettysburg from July to September, 1863. Update: Karen also portrayed Sallie Myers on August 1st, 2008. 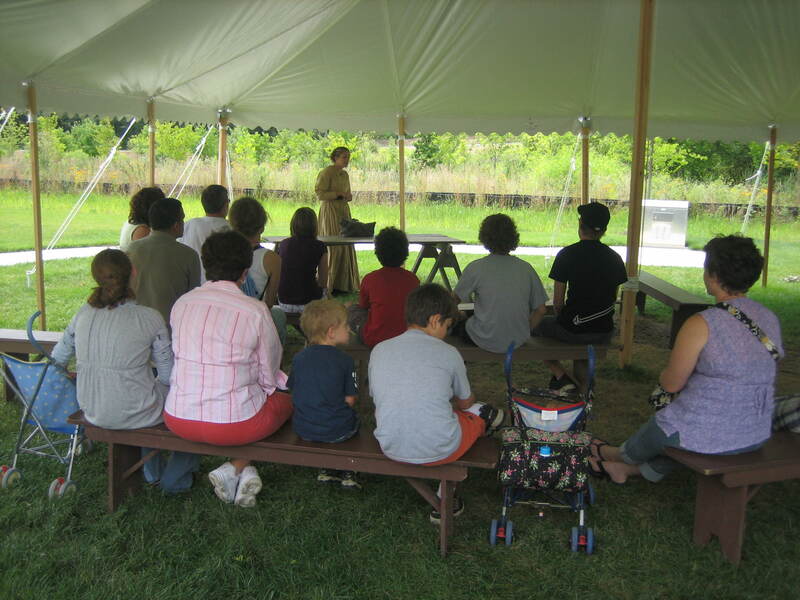 This program took place at Ranger Station #2 behind the visitor center. Karen first explains Cornelia Hancock’s background, and how she came to Gettysburg. Before she begins the program, she asks the audience if they have any questions. This view was taken from the east facing west at approximately 1:30 PM on Thursday, July 24, 2008. Karen then goes outside the tent, and when she returns, she presents her first-person portrayal of Cornelia Hancock. 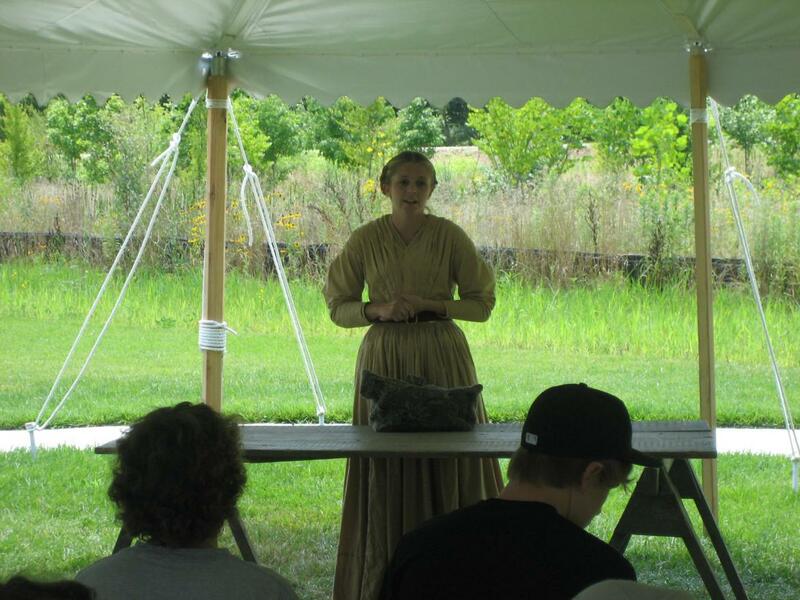 She tells the good and the bad of the Gettysburg battlefield and its hospitals in the weeks following the battle. At the end of the program, she becomes Karen again, and answers any questions that the audience may have. This view was taken from the northeast facing southwest at approximately 1:30 PM on Thursday, July 24, 2008.